Creeping saltbush (Atriplex semibaccata R. Br.) is a shrub from dry and saline regions that is a valued forage. Atriplex semibaccata is a prostrate, spreading, mostly evergreen perennial undershrub, with a short to medium life span (Le Houérou, 1992). It can reach a height of 0.8 m and a diameter of 1.5-2 m. It has a deep root. The branches are sprawling, whitish in colour. The leaves are alternate, scurfy and white in colour. The leaf blade is narrow, elliptic to oblong, 3-4 cm long x 0.2-1.2 cm wide. The lower face of the leaves is densely hairy. 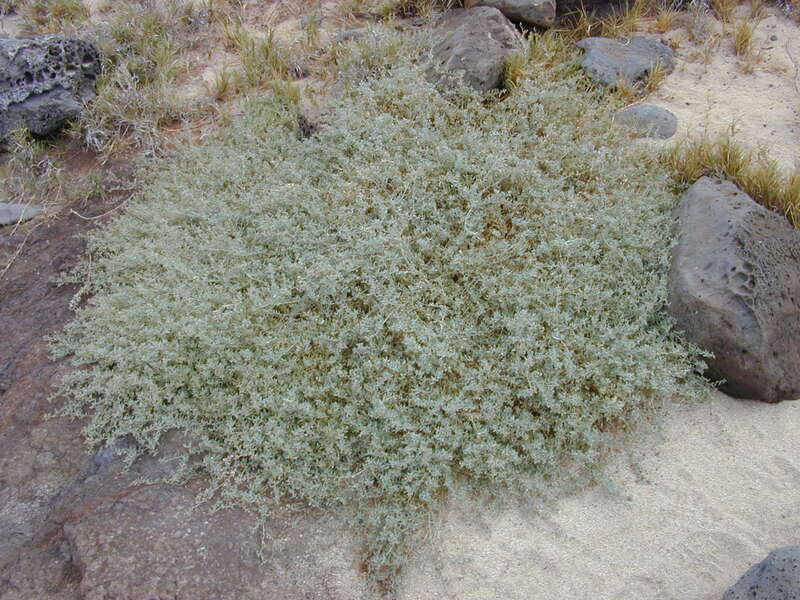 Creeping saltbush is a monoecious plant. Female and male flowers are borne on different parts of the shrub. Female flowers are borne in small scattered clusters at leaf-axils and male flowers are borne in small glomerules at the extremity of the branches. 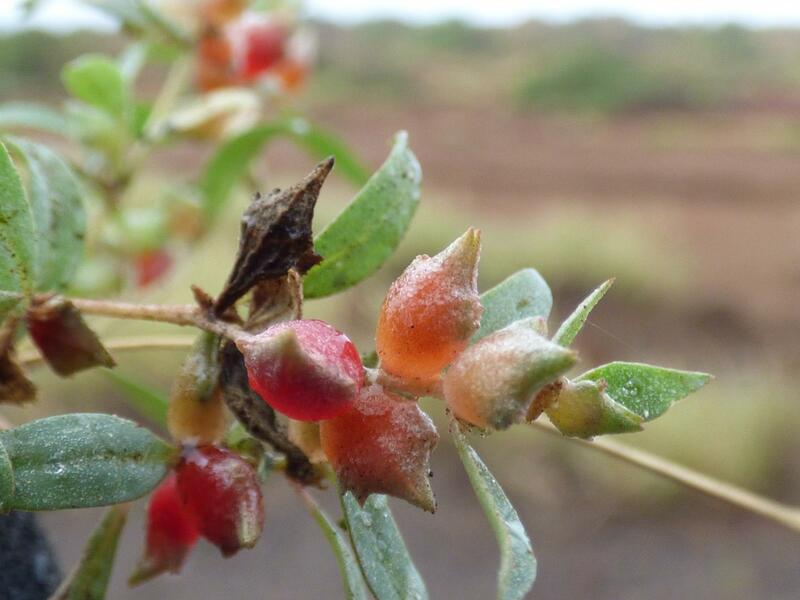 The fruits of creeping saltbush are 4-6 mm long, diamond-shaped, with juicy red flesh and are edible. The seeds are minute, dimorphic, either black (1.5-1.7 mm) or brown (2 mm) (FNAEC, 2015). Creeping saltbush is a very variable species that adapts to many edaphic conditions. Under water stress, leaf size, root diameter and the number of chloroplasts decrease. Photosynthesis also decreases and the number of stomata increases. Creeping saltbush is the only species of the Atriplex genus that becomes dormant during winter (Pasiecznik, 2015). Creeping saltbush is highly valued as a dry land forage, and may be used for erosion control: it provides good ground cover. It is also used for reclamation of salt lands (Pasiecznik, 2015). Atriplex semibaccata originated from Australia. It was introduced into Tasmania and many other parts of the world as a drought and salt tolerant fodder crop. It is now widespread in North-Africa, the horn of Africa, the Middle-East, parts of Southern Africa, the Arabian Peninsula and Southern Europe. In 1901, creeping saltbush was introduced into California as forage suited to alkaline soils for livestock. In America, creeping saltbush can be found in Mediterranean climatic regions (e.g. California, Baja California, Chile, South Africa). 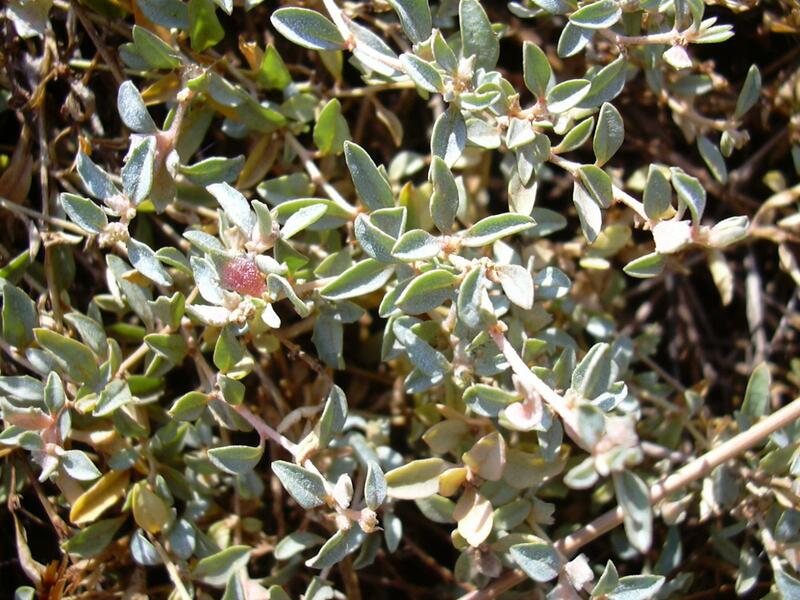 Creeping saltbush is found from sea level up to an altitude of 750 m in areas where annual temperatures range from 10 to 23°C and where annual rainfall is between 250 and 900 mm. It is a hardy species that can withstand long drought periods and salt-laden coastal winds. It can survive light frost (-5°C) and seasonal waterlogging. 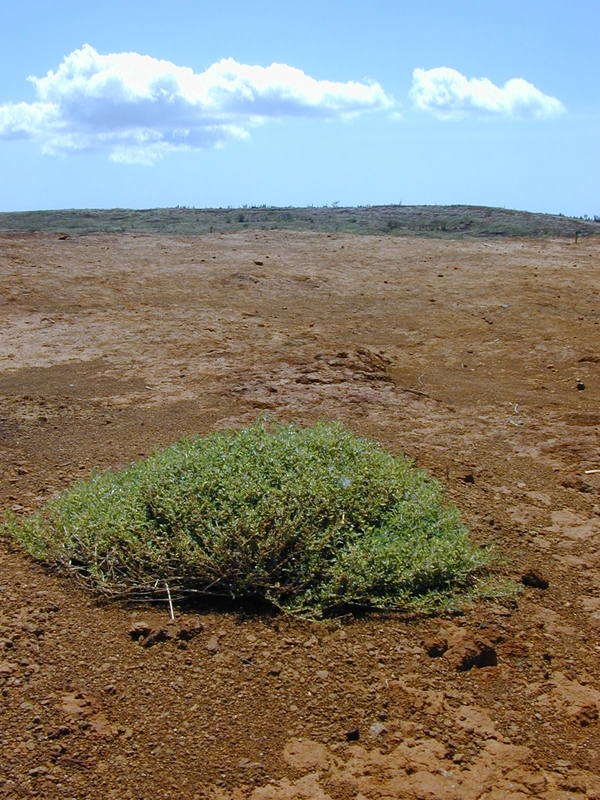 Unlike Atriplex nummularia, Atriplex semibaccata is suitable for acidic soils (pH below 6.5). It has moderate to high tolerance of salinity (up to 15 dS/m). Creeping saltbush grows in full sunlight (Florabank, 2016). Atriplex semibaccata is a xero-halophyte, usually found on clay, clay loams and loam soils. It also occurs on sandy loams (sometimes slightly saline), in woodland, saline flats and edges of salt lakes (Le Houérou, 1992). It is a pioneer plant in disturbed areas (Pasiecznik, 2015). Atriplex semibaccata is propagated by seeds. As a sprawling species, sowing density can remain relatively low, about 1000 seeds/ha (Le Houérou, 1992). Its grazing value is fair, establishment through direct sowing is easy, but persistence is poor. It generally disappears after three or four years, but favourable management allows the plant to survive longer (10-15 years) (Pasiecznik, 2015; Le Houérou, 1992). On shallow silt-rich soils (soils having a shallow surface lime crust), creeping saltbush yields 1-5 t DM/ha per year, of which 70% is forage DM (Le Houérou, 1992). Atriplex semibaccata is a good species for erosion control, forming a dense and fire retardant ground cover (Pasiecznik, 2015; Le Houérou, 1992). It is recommended for range rehabilitation (Le Houérou, 1992). It was successfully used for the restoration of mined sites in Western USA (DiTomaso et al., 2013). This species is appropriate for escarpment shrublands and plain woodlands. It is one of the few species that may be reliably established below dense established plantations of Eucalyptus and Acacia (IFFA, 2010). In Australia, its compatibility with vineyard ecosystems has been assessed: it provides perennial soil cover, habitat for beneficial invertebrate species, enhanced earthworm populations and cooler soil temperatures, while not impacting significantly on vine production when grown in warm and dry inland regions (Penfold, 2011). In Hawaii, Atriplex semibaccata is a threat to native species like Panicum nihauense or Scaevola coriacea, which are both endangered. Atriplex semibaccata is moderately rich in protein (8-22% of DM) and, like other plants of the Atriplex genus, extremely rich in mineral matter (18-24% of DM) at the expense of its energy value. It is recommended to test Atriplex semibaccata forage prior to feeding as it may contain oxalates (O'Donoghue et al., 2011). Recent information about the use of Atriplex semibaccata in ruminants is almost non-existent (2016). However, general information on Atriplex spp. suggested that creeping saltbush, while providing valuable crude protein, does not contain enough energy and could only sustain sheep and goat maintenance but not growth, milk or wool production (Le Houérou, 1992). Digestibility of OM is in the 50-60% range (Headden, 1908; Norman et al., 2010). Creeping saltbush was reported to be readily eaten by goats and alpacas, and reasonably well by sheep (Sampson et al., 1963). However, a more recent study showed that creeping saltbush was also readily browsed by sheep (Mallee, 2011). Creeping saltbush is one of the saltbushes that are most grazed by alpacas, offering them variety in the diet. Good water supply must be available to the animals at all times (O'Donoghue et al., 2011). It was reported to be of no value for cattle (Sampson et al., 1963). Birds are fond of the saltbush fruits (Göhl, 1982).